Home Journal Entries What is the Journal Entry for Discount Allowed? Discounts are very common in today’s business world, they are generally provided in lieu of some consideration which can range from timely payments to market competition. While posting a journal entry for discount allowed “Discount Allowed Account” is debited. 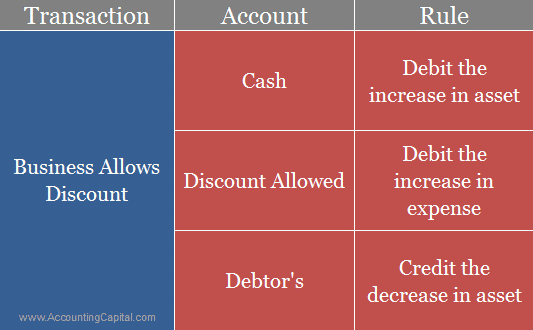 Discount allowed acts as an additional expense for the business and it is shown on the debit side of a profit and loss account. Trade discount is not shown in the main financial statements, however, cash discount and other types of discounts are supposed to be recorded in the books of accounts. In case of a transaction where both trade discount and cash discount are allowed, trade discount is allowed first and then cash discount is processed. It is journalized and the balances are pushed to their respective ledger accounts. Discount allowed ↑ increases the expense for a seller, on the other hand, it ↓ reduces the actual amount to be received from sales. Discount allowed by a seller is discount received for the buyer. The following examples explain the use of journal entry for discount allowed in the real world events.